Hello and welcome to MummaBstylish, I'm so pleased you could stop by today. Finally time for the ladies at 5Over 50 to attack the last challenge of the year. We've taken on hats, orange, lace & metallics to name but a few. All have been faced with great enthusiasm, gusto and some trepidation, but the outcome has proved first class for all of us. The December challenge was set by Laurie. The obvious task for the month of December festive jumpers! Are you a Christmas jumper wearer? Actually I'm not! I don't know how I missed out on this tradition, maybe because I haven't been at work for years, and it's not something me or my family do. That being said I still wanted to join in the fun, but with my kind of twist on it. I've managed to borrow a jumper and bought a stunning little Christmas brooch to make it just a bit more festive. So I hope I've managed to pull this one off - do I look suitable Christmassay? My daughter supplied the gold sequined sweater which I've matched with my pleated gold skirt. I do love a bit of bling and it proved to be a winner for the challenge. You can see what else it goes with over on my previous post Styled with tassel boots. The gold jumper is covered in sequins giving a shiny finish, jazzing an otherwise plain jumper. This belongs to my daughter, and I'm chuffed that I fitted into it! How pretty is this brooch? I bought this from Ebay and when it came it was a little smaller than what I'd seen in the photos! The red and green bells stand out regardless of the size. Comfortable boots, and warm coat were the order of the day for Sunday. That red coat has been top of my list for a while now and is really making me feel festive. Let's take a look at my four other friends to see just what their Christmas jumpers are saying about them. Gail from Is This Mutton? has got us all feeling and looking very much the part for Christmas celebrations. Sad to say this is Gail's last challenge as she is cutting down on some of her blogging duties. Wishing her all the luck in the world, but thankfully you can still catch the odd post on her Is This Mutton? blog. 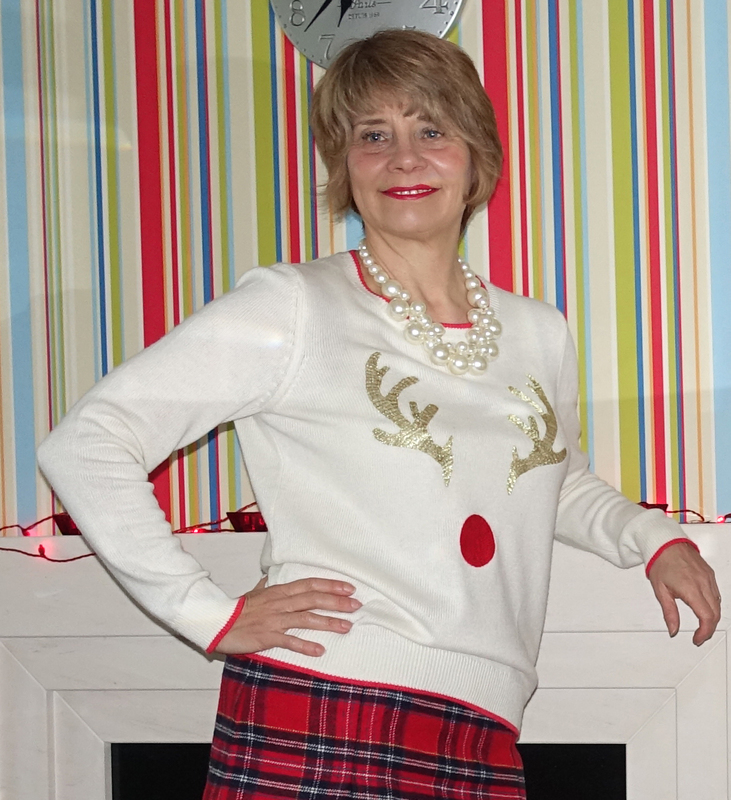 Gail's outfit a mix of highland with a hint of Rudolph. How cute is this Boden jumper? Laurie's classic and traditional red jumper looks perfect with the bold Christmas tree detail. A statement jumper to compliment her pleated skirt. Thanks for the task Laurie - I think we've all come up trumps with your choice of challenge. I wonder if Anna is short of kisses with her cheeky black jumper - no need to carry mistletoe with this choice, it's already on show! Wow what a wonderful skirt too - you're ready for any festive occasion Anna! I hope we've made you feel suitably festive and ready to take on Christmas with joy and fun. It's time for the final push as we get ready to relax and enjoy Christmas to the full. I'd also be pleased to see you here on Thursday for the full story of what I did on Sunday when my photos were taken - here's a little clue.... small train and Father Christmas! Thanks for stopping by today, see you soon. I am so in love with your sequin jumper. it is so stylish and chic! Fun challenge. I love your gold and red pairing! Lovely choice Jacqui! gold suits you very much! Sparkle and shine is exactly what I think of at this time of year!! It's wonderful Jacqui!! How wonderful to get to share clothes with your daughter, twice the wardrobe that way! This sweater is s pretty and festive for the holidays, love it with the brooch and your skirt too. Very elegant! You're sooo very cute! Merry Christmas Gorgeous! That gold sweater is just stunning! I love that you can share clothes with your daughter, the wardrobe doubles basically right? Like Nancy, I'm always looking for a gold jumper for Christmas but never find one! Loe your sequinned number and the cute brooch. Have a wonderful Christmas Jacqui! 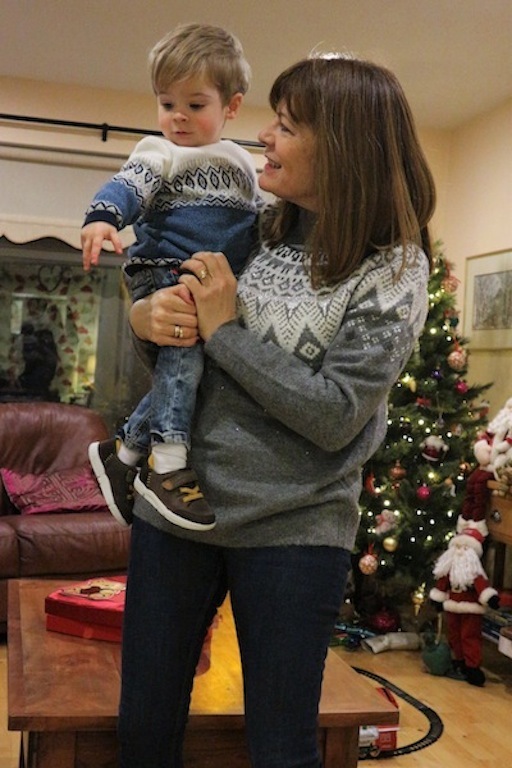 How lucky are you to have a daughter who shares her lovely Christmas jumper, and yes - you do look Christmassy enough! The brooch is a dear little addition too, very festive. Merry Christmas to you Jacqui! I love all of these festive sweaters!! Your red coat is so fabulous too! Jacqui, I love your gold sweater and it looks so great with the matching pleated skirt and red coat for a super sophisticated holiday outfit! This is the first year that I really embraced the silly, quirky, fun festive attire. But you can never go wrong with some sparkle at the holidays either! I wish you a very Merry Christmas. What a spectacular and classy sweater/jumper - it's such a festive piece, looks wonderful. I love the subtle shimmer in the jumper, gorgeous skirt too! I've started whipping my tape measure out before buying jewellery online so I know what to expect...been caught out too many times! Thanks for linking up Jacqui, wishing you a very happy New Year!